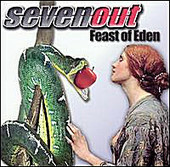 Detroit rockers Sevenout have got a different kind of vibe going on than most of the band's peers in the pop-rock genre. Maybe it's each member of the trio's vast musical experience that ranges from hard rock to blues that makes tracks like the arena rock flavor of "Forever" and the smokey ambiance "Where It Hurts" stand out. Containing 10 tracks of tasteful rock tunes that won't dumb you down with contrite lyrics, Sevenout mixes the best of Black Crowes, Kiss, and Cheap Trick and come out with a solid rock offering.